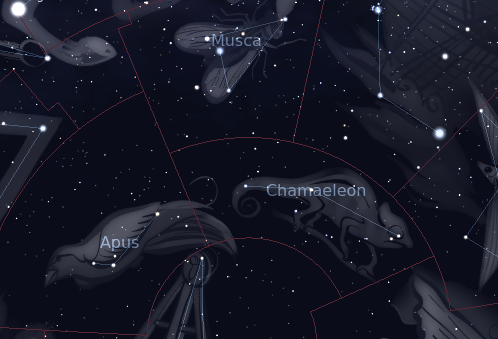 The constellation Chamaeleon. Roll mouse over to see labels. 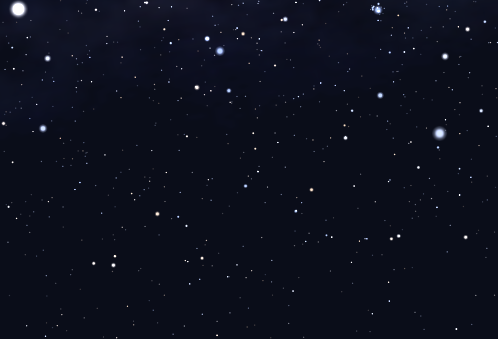 Chamaeleon is the tenth smallest constellation. It lies close to the south celestial pole, where it appears highest in the evening sky in the months around February. It was among a dozen constellations introduced by Pieter Dirkszoon Keyser and Frederick de Houtman which celebrate rare or exotic animals, and first appeared on star maps in 1598. Chamaeleon does not contain any bright stars or deep sky objects; the lizard's body is represented by a grouping of fourth-magnitude stars. It contains one Caldwell object, the planetary nebula C109 (NGC 3195). Chamaeleon contains the following Caldwell object: C109. The following constellations neighbor Chamaeleon: Apus, Carina, Mensa, Musca, Octans, Volans.